The old Hatchery, Blind Lane, Aiskew, Bedale. Pain, pins And needles, numbness, loss of power, these are some of the symptoms that you may experience if you have a problem that causes irritation or compression to a nerve. This can be caused locally such as in the arm or leg but more often is caused from a central source such as your neck or back. A physiotherapist can be very effective at being able to diagnose the cause of your pain and formulate a treatment plan. This is an injury usually caused by the head being thrown in different directions (usually forwards and backwards) This can occur through a number of different incidents but is usually associated with vehicle collisions. Whiplash is most commonly felt in the neck but can also cause symptoms in other areas. Spinal pain can be felt in any part of your spine, including the neck, thoracic and lower back. It is a large cause of time off work and can cause many individuals to be fearful about moving and returning to work, exercise and their normal lifestyle. Susan will assess and provide an explanation of the problem and formulate a treatment plan, enabling you to gain the confidence and reassurance to move and regain control back over your lifestyle . Sports injuries can be any soft tissue or bony injury relating to a sporting activity, this can be something that occurred suddenly or as a gradual build up that may have started off as a small manageable niggle but built up into a painful problem. Many injuries relating to sport can be managed by assessing technique, equipment, training schedules, biomechanics as well as the individuals themselves. Susan has treated a wide range of individuals with various different sports related disorders. This can be any soft tissue or bony injury related to repetitive strain/overuse and trauma. 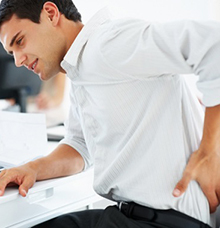 Many work related pains are due to poor sitting posture this can manifest itself in any part of the spine as well as referred pain into the upper and lower limbs. Manual jobs can also cause a wide variety of symptoms especially where heavy loads are involved. Some injuries and dysfunctions can be caused by repetitive, smaller fine movements for example in the hand. Susan will assess any possible causes by taking account of your background history, this may be work or activity related. She will look at how your body moves in relation to your painful area. A treatment plan can then be formulated. These injuries can start from any cause. They can include, strains, Sprains, tears and tendinopathies. The sooner you seek help from a physiotherapist the sooner you should recover. This includes surgery for any bone, muscle, tendon, joint and ligament problem. Physiotherapy can help with building up your strength and flexibility prior to and after an operation. Can affect one or many different joints including the spine, this depends on the type of arthritis you may have. This could be osteoarthritis, rheumatoid arthritis as well as some other forms of arthritis. It can be beneficial to see a physiotherapist for an opinion. In some cases the pain you experience maybe coming from the surrounding soft tissues and not necessarily the joints themselves. Susan will be able to diagnose the nature of your pain and offer her opinion if it is arthritis related. She will then discuss with you the treatment options which may include, exercise therapy, joint mobilisation, as well as a wide range of other treatment options (see services).Susan may also discuss with you the possibilities of a corticosteroid injection which can be very effective in helping reduce the pain and swelling associated with some forms of arthritis. Susan has many years experience in performing joint and soft tissue injections, this would need to be done in communication with your GP who would need to Issue a private prescription. In some ladies pregnancy can be uncomfortable and can be the cause of such pain related disorders such as pubic symphysis (Near the pubic bone) and sacroiliac Dysfunction (The area where your spine meets your pelvis) and spinal pain. Physiotherapy can help with alleviating discomfort. Pilates can be particularly useful in these circumstances as well as some forms of manual therapy. These can include any joints such as shoulder, knee, ankle, foot, hand, spine, hip, elbow, fingers. Having Joint problems/pain doesn't necessarily mean you have arthritis. Susan has many years experience in screening for joint pain. In the majority of cases joint pain can be treated very effectively with physiotherapy. Susan will be able to assess from your medical history if there would be any need for further investigations. DO YOU SUFFER RECURRING HEADACHES/MIGRAINE? Manual therapy to the upper neck and sometimes thoracic spine as well as acupuncture can help in many cases. 10% discount available Ring 07432 826432 to find out if you are eligible. Our physiotherapists are experienced in treating both short term and long term pain. Modified clinical Pilates targets the stabilising muscles of the body using control balance and fluidity. 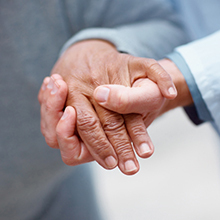 We have experience in treating a range of painful joints, from your hands to your ankles. Whether a sudden or gradual injury we are experts in treating you quickly and efficiently.